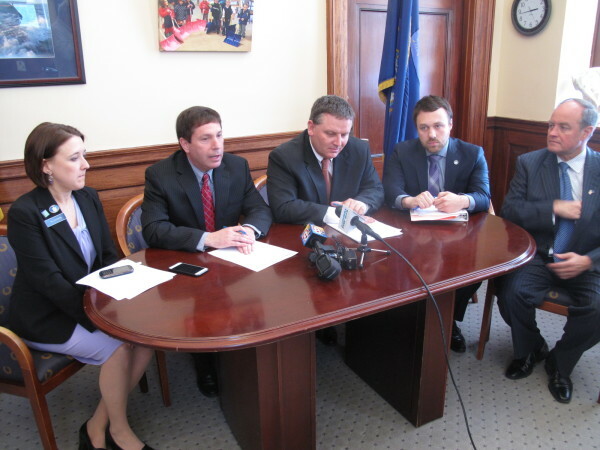 Republican legislative leaders discuss their reaction to a Democratic tax reform proposal during a press conference on Thursday, April 9, 2015, at the State House in Augusta. From left are Assistant House Minority Leader Ellie Espling, R-New Gloucester; House Minority Ken Fredette, R-Newport; Senate President Mike Thibodeau, R-Winterport; Senate Majority Leader Garrett Mason, R-Lisbon, and Assistant Senate Majority Leader Andre Cushing, R-Hampden. AUGUSTA, Maine – After late-night negotiations that apparently moved the Appropriations Committee closer to a deal on a roughly $6.57 billion two-year budget that must be in place by July 1 to avoid a government shutdown, the political battle among Republicans over including tax cuts in that budget hardened Monday. Senate President Mike Thibodeau, R-Winterport, defended a compromise that would not include income tax cuts in the two-year budget but would move the state closer to a constitutional amendment requiring a two-thirds vote to enact future income tax increases. Breaking with Thibodeau, House Minority Leader Ken Fredette, R-Newport, reiterated his commitment to resisting any new two-year state budget plan that does not include welfare reform and income tax cuts, two priorities that Gov. Paul LePage included in his budget proposal. During a meeting with media on Monday, Fredette said his House caucus remains resolute that any budget package include an income tax reduction and spending cuts. “The people of Maine have been tightening their belts, and it’s about time we do the same here in state government,” Fredette said. He also urged lawmakers on the Appropriations Committee to delay sending a final budget proposal to the House and Senate chambers on Monday. “I would like to see that we don’t close this budget tonight because we think that rushing to close this budget at this point in time will put us in a position where House Republicans will be put in a position, quite frankly, where we won’t be able to support this budget,” he said. Democrats argue that a budget and tax plan offered by Republicans would actually be a tax increase for all Mainers earning less than $57,000 per year. Citing data from the Maine Center for Economic Policy, a Portland-based liberal think tank, Democrats say the state’s top 1 percent of income earners will see an average tax cut of more than $8,300. He said House Republicans also wanted to provide funding to eliminate the waitlists at the Department of Health and Human Services for severely disabled individuals and eliminate hundreds of state jobs that have gone unfilled for two years. Fredette said his minority caucus met Monday and remained united behind that goal. But he also said minority Republicans in the House intended get a budget deal in place before the end of the fiscal year and had no intentions of forcing a state government shutdown. Lawmakers on the Appropriations Committee late Sunday reached preliminary agreement on a tentative budget deal that doesn’t include income tax cuts but instead offers voters a chance to make all future legislatures show two-thirds support for any income tax increases. While Senate Republicans on the panel have initially approved the plan, House Republicans are resisting it. Fredette said early Monday his caucus would fight, “tooth and nail” against the budget bill if it doesn’t include income-tax reductions. During a separate meeting with media, Thibodeau said all State House Republicans supported the same goal of lowering and eventually eliminating the income tax. Thibodeau said the proposal to require a two-thirds vote for any future income tax increase was best plan to protect a reduction, if enacted. Fredette said House Republicans had “nothing but respect” for their Republican colleagues in the Senate, but he also seemed dismissive of the Senate Republican proposal for a state constitutional amendment. “The principles in this budget that have been put forward by our governor and those who elected this Republican governor with the largest number of votes in Maine history, brought in a Republican Senate and picking up 10 seats in the House — that’s what we got elected on, not some constitutional amendment that’s popped up out of nowhere in the last 24 hours,” Fredette said. But Thibodeau said the idea is not a new one and that many Republican candidates included their support for the idea when they were campaigning both in 2012 and 2014. Thibodeau also said he and other Republicans support allowing voters to decide on a constitutional amendment to abolish the income tax, as proposed by LePage. Still it remained clear Monday that Senate Republicans were steadfast against paying for any income tax reductions with an increase or expansion of the sales tax in Maine, as proposed by LePage. Senate Majority Leader Garrett Mason, R-Lisbon said he ran and was elected in 2010 opposing a sales tax expansion that was overturned that same year at the ballot box during a citizens referendum on the issue. LePage, who has been bringing his budget proposal to public meetings around Maine, has planned a meeting for Lisbon, the heart of Mason’s district, on Tuesday night. Mason said while he supports much of what LePage has accomplished during the past few years, he isn’t on the same page when it comes to swapping an increased sales tax for a reduced income tax. Mason said he didn’t plan to attend LePage’s meeting Tuesday. He said the Legislature had double sessions planned for most of the week, including Tuesday.